10 Facts About Dimetrodon, the Non-Dinosaur "Dinosaur"
Dimetrodon is mistaken for a dinosaur more often than any other prehistoric reptile--but the fact is that this creature (technically a type of reptile known as a "pelycosaur") lived and went extinct tens of millions of years before the first dinosaurs had even evolved. Below you'll discover 10 fascinating Dimetrodon facts. Although it looks superficially like a dinosaur, Dimetrodon was actually a type of prehistoric reptile known as a pelycosaur, and it lived during the Permian period, 50 million years or so before the first dinosaurs had even evolved. Pelycosaurs themselves were more closely related to therapsids, or "mammal-like reptiles," than to the archosaurs that spawned the dinosaurs--which means, technically speaking, that Dimetrodon was closer to being a mammal than to being a dinosaur. Given its prominent sail, it's an odd fact that Dimetrodon was named (by the famous American paleontologist Edward Drinker Cope) after one of its more obscure features, the two different kinds of teeth embedded in its jaws. The dental arsenal of Dimetrodon included sharp canines in the front of its snout, ideal for digging into quivering, freshly killed prey, and shearing teeth in the back for grinding up tough muscle and bits of bone; even still, this reptile's dental arsenal would have been no match for that of the predatory dinosaurs that lived tens of millions of years later. To the untrained eye, the 200-pound Edaphosaurus looks like a scaled-down version of Dimetrodon, complete with tiny head and miniaturized sail. However, this ancient pelycosaur subsisted mostly on plants and mollusks, whereas Dimetrodon was a devoted meat eater. Edaphosaurus lived slightly before the golden age of Dimetrodon (during the late Carboniferous and early Permian periods), but it's possible that these two genera briefly overlapped--meaning that Dimetrodon may have preyed on its smaller cousin. One of the primary features that distinguished the first true dinosaurs from the archosaurs, pelycosaurs, and therapsids that preceded them was the upright, "locked-in" orientation of their limbs. That's why (among other reasons) we can be sure that Dimetrodon wasn't a dinosaur: this reptile walked with a distinctly ambling, splay-footed, crocodilian gait, rather than the upright vertical posture of the comparably sized quadrupedal dinosaurs that evolved tens of millions of years later. As is the case with many prehistoric animals discovered in the 19th century, Dimetrodon has had an extremely complicated fossil history. For example, a year before he named Dimetrodon, Edward Drinker Cope assigned the name Clepsydrops to another fossil specimen unearthed in Texas--and also erected the now-synonymized genera Theropleura and Embolophorus. Two decades later, another paleontologist erected one more unnecessary genus, the now-discarded Bathyglyptus. Thanks to the fact that so many Dimetrodon fossils have been discovered, paleontologists theorize that there was an essential difference between the sexes: full-grown males were slightly larger (about 15 feet long and 500 pounds), with thicker bones and more prominent sails. This lends support to the theory that Dimetrodon's sail was at least partly a sexually selected characteristic; males with bigger sails were more attractive to females during mating season, and thus helped to propagate this trait to succeeding bloodlines. At the time Dimetrodon lived, reptiles and lizards had yet to assert their dominance over their immediate evolutionary predecessors, the plus-sized amphibians of the early Paleozoic Era. In the southwestern U.S., for example, Dimetrodon shared its habitat with the six-foot-long, 200-pound Eryops and the much smaller (but much more bizarre-looking) Diplocaulus, whose head calls to mind a gigantic Permian boomerang. It was only during the ensuing Mesozoic Era that amphibians (and mammals, and other types of reptiles) were consigned to the sidelines by their giant dinosaur descendants. There are no less than 15 named species of Dimetrodon, the vast majority of which have been discovered in North America, and a majority of those in Texas (only one species, D. teutonis, hails from western Europe, which was connected to North America hundreds of millions of years ago). A full one-third of these species were named by the famous dinosaur hunter Edward Drinker Cope, which may help to explain why Dimetrodon is so often identified as a dinosaur rather than a pelycosaur, even by people who should know better! If you happen to see a century-old illustration of Dimetrodon, you may notice that this pelycosaur is depicted with only a tiny stub of a tail--the reason being that all of the Dimetrodon specimens discovered in the late 19th and early 20th centuries lacked tails, the bones of which were detached after their deaths. 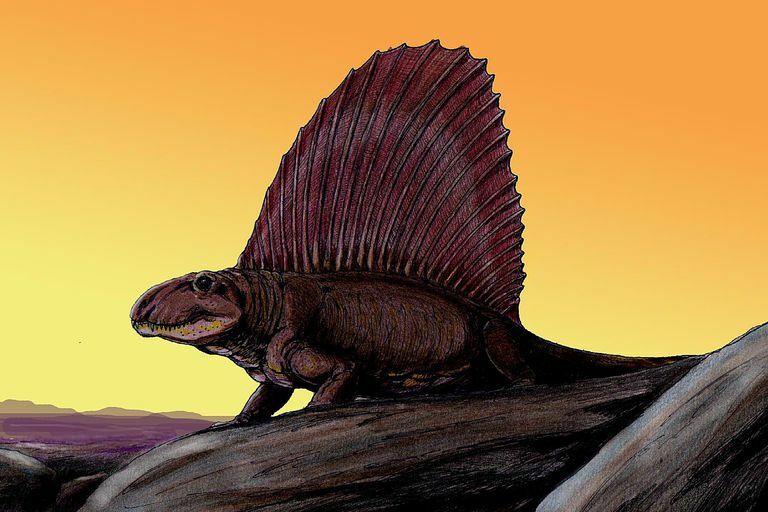 It was only in 1927 that a fossil bed in Texas yielded the first identified tailed Dimetrodon, as a result of which we now know that this reptile was reasonably equipped in its nether regions. How Many Horns Did the Triceratops Really Have?